Everyone has different reasons for wanting your product or service. And even the same people have different questions and needs depending on where they are in the buying process. The same message is not going to work for all of your prospects all of the time, so preparation is essential when setting up marketing automation for your business. It’s a daunting task, but if you lay a good foundation talking to people when, where and how they need it gets a lot easier. How to Create a Marketing Automation Plan for Your Business, our fill-in-the-blanks worksheet, guides you through the process so you can automate like a pro. 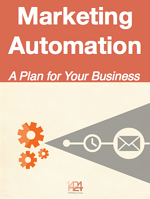 Submit the form to download the worksheet and create your marketing automation plan today!